Samsung 4K TV (Samsung JS9000 48-inch 4K TV, Samsung JS8500 55-Inch 4K TV) is very popular in the 4K TV filed, featuring some of the most innovative and advanced display technology on the market today, which delivers superb high dynamic range, beautifully enhanced quantum dot color and a full package of highly intuitive smart TV features at a price that won’t break the bank. If you hold an Samsung 4K TV, how about streaming Blu-ray movie on it? If you’ve set your Samsung 4K TV to the wrong source (input) it will not be able to display the contents of the disc you have playing. Cable connections between your Blu-ray player and your Samsung 4K TV maybe come loose at either end. Your Blu-ray player maybe set to the wrong output and resolution. Your Blu-ray player maybe detective. For playing Blu-ray on Samsung 4K TV without any issue, you actually can rip Blu-ray to Samsung 4K TV supported format so that you can play Blu-ray movies on Samsung 4K TV via USB port. And this will be a easy job with Pavtube Video Converter Ultimate . It is a professional and powerful Blu-ray ripper, which is able to break the complex copy protection of Blu-ray disc and change the “disc format” to Samsung 4K TV suitable MP4 format with original video quality. The upgraded version is equipped with “TVs” profile, where it lists the optimized video format for Sony/Samsung/LG/Panasonic TV so that you don’t need to adjust the video/audio parameters on your own. It is considerate for those who aren’t good at DVD ripping. For Mac users, it has equivalent product Pavtube iMedia Converter for Mac, which can help you rip Blu-ray to Samsung 4K TV on Mac. Start Blu-ray to Samsung 4K TV converter and insert Blu-ray disc to Blu-ray drive. 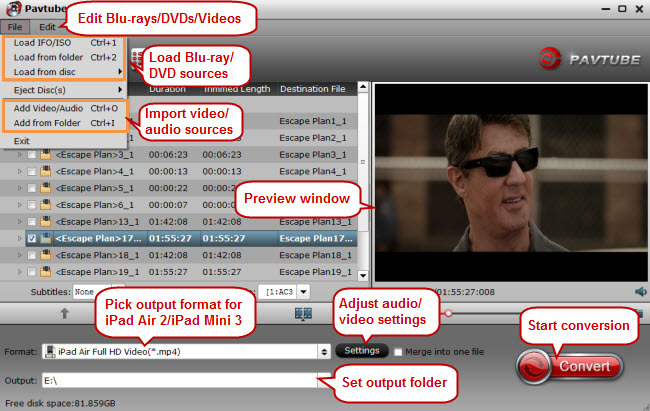 Click “Load File” to import Blu-ray movies to the software. 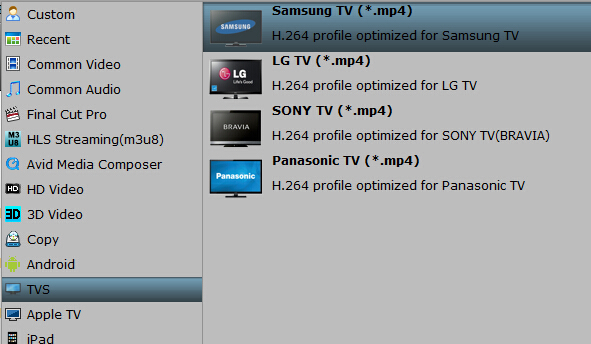 Set output video format under “Format” > “TVS”. The formats here have be equipped with the most suitable video/audio parameters according to the TV official website and user manual. You can choose “Samsung TV(*.mp4)”. Tip: You can click “Settings” to open the profile settings window to adjust the video and audio codec, size, bitrate, frame rate, etc in your favor. Click the “Start conversion” button at the bottom right corner; this video software will start to rip Blu-ray to MP4 for Samsung 4K TV playing via USB immediately. Once the conversion is done, simply go to the “Open” to find the ripped DVD files. Now, transfer your ripped Blu-ray movies to USB hard drive on computer. Take the external memory storage with you. When you want to enjoy Blu-ray movies on your Samsung 4K TV, just insert the USB hard drive into the USB port on your TV. Then, you can enjoy your favorite Blu-ray movies on Samsung 4K TV via USB freely. How to Watch Blu-ray on Wide-screen Samsung TV?